So your shiny new website is up and running – that’s great! What to do next? 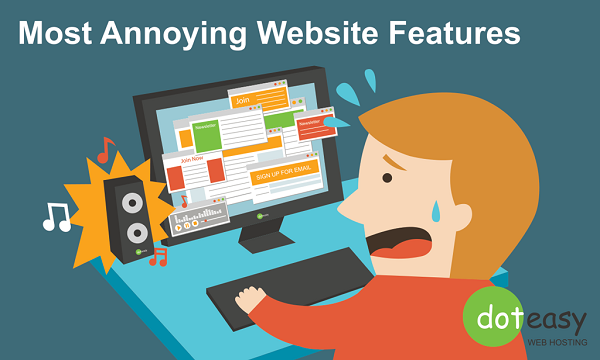 Check to make sure you’re not scaring off visitors by committing these oft-reported faux-pas of the online world. You’re happily scrolling through a website article, when BAM, a message pops up to tell you to subscribe to a newsletter, donate to a cause, or -wait for it- read an advertisement. How do you react? While pop-ups can sometimes be necessary, generally they will interrupt your visitor’s viewing experience and make for a cranky viewer. Does each blog point really need its own page? While you might temporarily increase sponsor revenues by breaking your “6 Tips for Better Skin” article into 6 different pages, (or 7 if you include an intro), this can be a big turn off to readers who want to quickly scan through it. If having a multi-page article is unavoidable, consider offering a “Read on one page” option for your impatient visitors. While you might expect that country pop hit to immensely enhance the viewing experience of your website, your visitors might disagree. Those at work or on the bus might especially find it displeasing if they weren’t expecting it. Bonus irritation points awarded if the on/off controls are hidden somewhere on a messy home page. Users won’t be happy when they’re scrambling to find the source of the auditory interruption. Keep in mind that many web users are multi-taskers who like to look at multiple websites at a time and listen to the music of their choice. Keep visitors happy by letting them browse through your content at their own pace. Have you stumbled upon a landing page that looked like it belonged directly on your living room wall? It looks beautiful, there are fun effect s- but lo and behold, you can’t seem to actually figure out what the site is for! A website that is logical to use and easy to navigate can impress a user much more than a gimmick-filled homepage. Do you agree with our list? Have more to add? We’d love to know your thoughts.